We were accepted as a participating shelter by the Pet Rescue Rx! 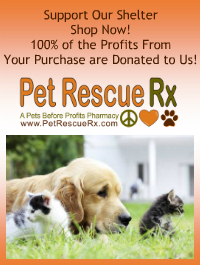 ALL Pet Rescue Rx profits will be donated to shelters and rescues selected by their customers. Their process is easy! After you place your order online, they will then contact your vet for approval of any prescription (Rx) products you have ordered. Over-The-Counter products do not need a vet’s approval and they will ship within 48 hours. Don’t forget to choose us as the shelter of your choice! For more information visit their website at https://www.petrescuerx.com/index.cfm? The final numbers are in from our #GivingTuesday/End-of-Year campaign! We are pleased to announce that we raised a total of $11,225.00 and we could not be happier! Thanks to your generosity, we can keep our adoptions affordable and continue to help many more animals find their forever homes. We would like, once again, to thank all of our donors for your continued support!